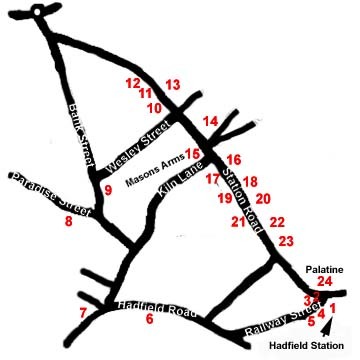 The map below shows 24 locations in the centre of Hadfield. You can walk around the suggested route in about half an hour to an hour, depending how often you stop to take photographs (or refreshment). You could, of course, walk it the other way round. Some other locations are further away - the Local Shop, for instance, isn't local; Mamma Mia's restaurant is in Hollingworth; the Roundabout Zoo was at Mottram and the interiors of the Windermere guest house were filmed at Windy Harbour Farm Hotel, a couple of miles away.